This level has hard difficulty. For this level try to play from bottom and make special candy as you get the chance. Move ingredients to middle part of the board or play near to ingredients to move them and take them out from the board. 2435 completed! Many, many boards! Used 1 hand switch, 2 lollipop’s 2 bring ingredients down. Mom open the next several episodes 4me please! WHAT is this BULL? 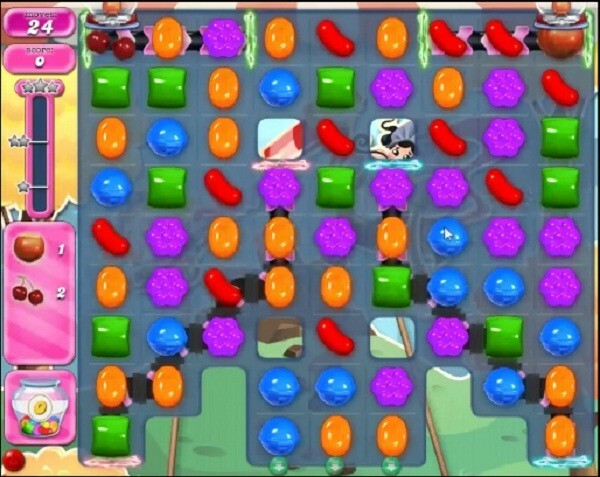 1) licorice WASN’T there yesterday 2) had MORE moves yesterday 3) more ingredients WON’T drop until you get one down 4) now since the borad is HARDER and you spend almost all your moves just to get the 2 down this is an IMPOSSIBLE LEVEL! 5) GROW UP CC!! Have a different board,22 moves with licorice in the centre.Thanks for listening & co-operation . This level has officially ended my Candy Crushing! Posting for luck because I just can’t get anywhere with this level. Ridiculous level. 22 moves and 17 licorice in the way. Only two fruit show up in the beginning. Third fruit only shows up after they are cleared from the board. Nearly impossible without hand switches. You will be on this level for MANY games. Why do I have licorice? This might be the level that finishes me off. Every level needs some booster, oh except jelly fish, they don’t ever eat the ones you need them to eat. Impossible level. Moves are enough only to clear the licorice and bring down 2 ingredients. ?? This level is impossible. I have licorice. There is none on the he walkthrough. I’m so disgusted I’ll probably have to quit playing. Help me! Like all above comments. I only have 22 moves. There are 9 licorices down middle with 4 more (2 on each side) of center at both top and bottom. They have no purpose and I have no score target. I have gotten fruits down a few times and I have no idea how I did it. Last fruit doesn’t come down until I have no moves left to do anything with it. HELP please. The boosters don’t really help, except maybe the hand switch and I only have one left and 2 hammers. I feel like using them is a waste because there aren’t enough. I USED to have about 100 of each booster and for some reason unknown to me they all disappeared overnight. I complained to [email protected] but they never got restored. I am still bitter over that but I guess it’s an “oh well” and that’s the end of it. That has been probably almost a year ago that that happened???? plus or minus. Licorice in the middle if the board. How come???? No way to clear licorice and move the fruit to the bottom. About ready to quit !!!! This is just so frustrating. I have so enjoyed Candy Crush but not any more! Well it helps to know others hate this one as much as I do! I don’t find it interesting or challenging. It is just a waste of time. I start the game and then just click it off. So boring! This is getting boring. Make a level tough by giving few moves and have to do a lot. Not buying it Candy Crush. Mom my board has black in the middle and yours don’t. Much harder so please fix because I can’t even come close. Well appreciated and thanks. Ya if we are going to show tips with 2 extra moves and no licorice then put our boards like that!